Cremation has become more common as a final disposition as time goes on. Often families are honoring the wishes of their loved ones who have made this choice. At Sheehy Funeral Home, we are dedicated to offering a full range of options to families with Cremation as the final disposition. Those options include, but are not limited to Direct Cremation, limited services or full traditional services. Many families choose a visitation in our chapel with their loved one present, either within a casket, or a Cremation Urn with a photograph of your loved one. These services can be personalized according to the wishes of the family. We’ve also provided Memorial Services both indoor and outdoor in a Memorial Garden. In the case of a Memorial Service, we can provide Memorial Registry Books, Service Folders, Flag Cases, Personal Floral Tributes, or any theme or motif that facilitate a dignified service for your loved one. We will coordinate with Faith Directors in parishes and congregations for the most appropriate services. In the Roman Catholic Church, within its Rite of Christian Burial, the burial of cremation remains in consecrated grounds has been approved. Sheehy Funeral Home offers a full selection of urns and containers for burial, entombment, or safe keeping. “Ultimately, we want to give families all of the options available to them. We can pre-plan or make funeral arrangements at-need. We’re here to help families celebrate the life of their loved one in the manner they desire”, says Bill Kiley, a long time funeral director at Sheehy Funeral Home. Whatever a family needs or desires; we’ll provide. For details about Cremation, Pre-Planning, At-Need arrangements, or any questions at all, contact Bill Kiley or any of our Licensed and Professional Staff at 708-857-7878 or www.sheehyfh.com We’re here 24 hours a day, 7 days a week. There was a time a couple of generations ago where the “neighborhood” funeral home was automatically where you went. It’s just the way things were for families who never considered anywhere else. Today, that has changed. Families are more spread out and there are many factors to consider before entrusting the services of your loved one to someone or some place. Bob Sheehy will tell you the greatest factor is “Trust”. A Family Funeral Home like Robert J. Sheehy & Sons that has been around a long time in Orland Park and Burbank have the skill, knowledge and reputation, for over 100 years, understand how important Trust is to families. 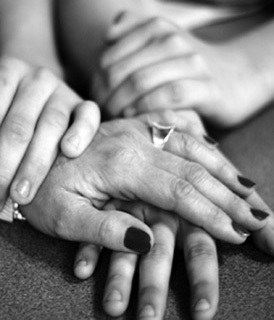 Knowing that a family is directing the care of your loved one and will be with you every step of the way is important. What has always been true, and always will be, is that these services are the last bit of time that families will have the opportunity to honor their loved one, share fellowship with family and friends together in the presence of that loved one, and properly be able to say their farewell. You have to get it right, every time, and there are no second chances. That’s why Trust is so important. Bob and Jim Sheehy were taught that by two generations who came before them. With over a century in business, the Sheehy Family has provided services for 5 and even 6 generations of families on the South and Southwest sides of the Chicago area. Simply stated by Bob Sheehy, “It has truly been our privilege”. “It’s truly remarkable to us how loyal families have been to our family”, is how Jim Sheehy describes the feeling. Along with his brother Bob, they are the “sons” in Robert J. Sheehy & Sons Funeral Home, with locations in Orland Park and Burbank. The Sheehy name and services is measured not in years or decades, but a century. For 3 generations, the family has been providing funeral services on the south, and southwest side and suburbs of Chicago. So many of the families are families that have been served by Jim and Bob’s grandfather, father and uncles, and now it’s their honor to serve. “Our name and reputation is important to us because of the generations who served our community before us. To know that when people are experiencing their most difficult and trying times in life, they are choosing us to help them is a very humbling feeling and a great honor for us”, states Jim Sheehy. He adds, “the southwest side of Chicago is among the most unique places there is. The closeness of families and the loyalty among them is incredibly special”. Sheehy Funeral Home took care of everything. In the case of Pat Byrne, when he experienced a terrible loss, he was already a very close friend of Bob Sheehy. It’s only with reflection over some years that Pat wondered how Bob was able to handle the professional elements of arranging and directing funeral services and yet be the emotionally supportive dear friend to him at the very same time. The Sheehy Family has been taking care of family, and friends for 3 generations and over 100 years. After that much time, so many of the families you serve are friends and neighbors and people we know and love. When it’s such a close friend, it reminds you of the impact of losing a treasured loved one. That’s a feeling we do our best to remember with every family we make arrangements for. It’s also a great reminder of what a privilege it is to be in the position to provide the service we provide. What Families look for more than anything is Trust. In the past, the determining factor in choosing a funeral home had more to do with location and being close to the neighborhood. What has transcended that now that families are more spread out, is a sense of trust. Knowing that a family is managing the care of your loved one and will be with you every step of the way is important to families. What hasn’t changed and never will, is that these services are the last time a family will have an opportunity to honor the life of their loved one and offer extended family and friends the opportunity to offer comfort, share precious experiences and say farewell as a community to a very loved member of their family. Connecting to a Funeral Home that’s been there for generations with a family maintaining long relationships over time is important to people. With over 100 years in business, the Sheehy Family has provided funeral services to as many as five generations of families who have chosen them at their time of need or for prearrangements. As Bob Sheehy says, “it really comes down to trust.” It’s a privilege to have the trust of the families who choose Robert Sheehy & Sons. Generations of the Sheehy Family serving generations of your family. “I’ve been going to Sheehy’s since I was a young child” says Willie Winters, a lifelong Southside resident who grew up in a family that always paid their respects to the families in the tight knit communities of Chicago’s Southwest side and close in suburbs, like Beverly, Mt. Greenwood, Scottsdale, Burbank, Oak Lawn and Evergreen Park. It would be easy to go on and even start mentioning all the Parishes that helped keep those families so close. What Willy remembers then and continues to see now, is the legacy of service for 3 Generations of the Sheehy Family. Willy remembers Robert Sheehy Sr. and is a contemporary of Bob and Jim Sheehy now. “What has remained constant is the ‘Air of Dignity’ among the entire family. It continues to today”. While so many things have changed about funeral homes, like Pre-planning, Cremation, Memorial Services, etc., it remains vitally important to the Sheehy Family that the continued professional service and that “air of dignity” never change. Generations of the Sheehy Family have been assisting generations of Chicago area families in Burbank and Orland Park for over a century. They’re there when you need them, day or night, every day of the year. To discuss funeral planning options at time of need or for a complimentary pre-planning session with our professional Funeral Directors click here or contact us at 708-857-7878. Memorial Services are Part of Changing Family Traditions for Many. Anyone can choose a Memorial Service and often times it makes the timing of the service more convenient for people who wish to celebrate the life of a loved one. The time constraints of today’s society make it more difficult for people to attend services who would really like to be there to comfort family members and friends. Memorial Services often make it easier to help friends and family plan for a service. Saturday afternoons have become a time many people choose to optimize the chance of people being able to attend. Having a Saturday Memorial Service means families are not forced into a burial the next day with cemeteries not doing burials on Sundays. It can ease some pressure for families. Consultations are a complimentary service at Sheehy Funeral Home and there is no obligation. “How loyal people are to us is truly remarkable to us” states Jim Sheehy. Keeping the Sheehy name and reputation strong is important to Bob and Jim Sheehy. Knowing that when people need them, they are experiencing among the most difficult times of their lives and they call the Sheehy Family for help, is humbling. Over a century of service and into our third generation of our family serving families on the south and southwest sides of Chicago, we appreciate the loyalty to our service and commit to every family that we’ll do everything we can during their most difficult times. Connecting to a Funeral Home that’s been there for generations with a family maintaining long relationships over time is important to people. With over 100 years in business the Sheehy Family has provided funeral services to as many as five generations of families who have chosen them at their time of need or for prearrangements. As Bob Sheehy says, “it really comes down to trust.” It’s a privilege to have the trust of the families who choose Robert Sheehy & Sons. When Pat Byrne needed the services of his friend Bob Sheehy, he needed his friendship at the time of tragic loss just as much. “I don’t know how he did it” recalled Pat, adding “as a professional he left no stone unturned, while at the very same time providing me comfort at the time of a terrible loss”. He was the first guy to come to Pat’s need as a friend and professional. As Pat thinks back, he doesn’t know how Bob was able to be such a great friend and great professional at the same time. The truth may be that there is no boundary between friendship and service when the families you serve are not just “like family”. They are “family”. Inside and outside, we wanted Sheehy Funeral Home to feel more like a home. “When we built our new funeral home in Orland Park, it gave us an opportunity to think a different way about how funeral services could be more comfortable for families and friends who visit during difficult times” says Kathy Sheehy, who created the new décor for the Orland Park funeral home. From softer colors, to large windows providing sunlight, to higher ceilings, to more comfortable furniture, to a large octagonal coffee room with a charming and cheerful patio feel, no detail was overlooked in creating a space that offered comfort. “The sitting areas outside of the visitation area itself are very important to our overall space” according to Bob Sheehy. Adding “Even when people come for Preplanning funeral arrangements, I can see how important these oases of comfort are to them. It’s important to us that people feel that while they’re here, this is their home”. One of the most beautiful and rewarding things that happen to us is something we call a “Rose”. That’s what we refer to the letters and cards that come to us after we’ve completed services for a family. “It means a great deal to us when a family takes the time to tell us we exceeded their expectations. The whirlwind of emotions that occurs when a loved one passes is so overwhelming, that when a family sends us a card telling us that we helped them through this difficult experience, it just means a great deal to us”, according to Bob Sheehy. Adding, “With everything they have on their mind, it’s just very touching for them to think of thanking us. We save every one of these notes”. They’re not just saved. Every member of the Staff is given the opportunity to read the “roses”. Often, one of our Funeral Directors or another valued staff member is being specifically thanked when Sheehy Funeral Home goes above and beyond in the area of servicing the families that have trusted them for 3 generations on Chicago’s South Side, with funeral homes in Burbank and Orland Park. “It’s just nice. They don’t have to do it, so when they do, it’s pretty special” said Jim Sheehy. A rose by any other name is a testament to a job well done. So much of what we do relies upon generations of traditions and customs in comforting families who have experienced loss. Gathering with the family is an instinctual and compassionate response for people. Our mission is to provide a comfortable environment and professional service that leaves a family with only one responsibility; greeting their guests and celebrating the life of their loved one. Technology is now a part of our service. When you enter Sheehy Funeral Home, among the first things you’ll see is a large screen image of the person you are there to honor and a directory to which chapel the visitation is in. It can also relate the information for religious services and place of burial. The person you are coming to honor is usually the first image you will see upon entering. Aside from the very practical benefits of this use of technology, it is viewed as a very warm welcome too. When you enter our chapel, we have an electronic kiosk for registering visitors. It’s still new for many people, so we have an attendant nearby to help anyone use the kiosk to register their name and address in the guestbook. It’s easy to use and our families have appreciated how much easier it has made it for them to send “Thank you” cards after the services. The technology of the electronic registry has eliminated the problem of trying to decipher handwriting and more complete information is available when the services are over. We provide completely accurate pre-printed envelopes addressed to your guests who signed in at the visitation, saving families hours of time and effort when the efficiency is most appreciated. At Sheehy Funeral Home, we’re always looking for any way to make a difficult time a little easier.